I was super excited to read Kiersten White’s newest release ‘Illusions of Fate’, as I really enjoyed her Paranormalcy trilogy, and I couldn’t wait to see what adventure she had for us next. When Jessamin left her small island home in Melei to come to the dreary country of Albion to study at an illustrious school, she never thought things would be as hard for her as they are. Judged by her dark skin and called an island rat by her peers, she’s come to despise the people of Albion. But things get interesting when she meets Finn, a young lord who shows her that Albion’s nobility is not exactly what it seems, and that secrets can be deadly. Jessamin was a really interesting main character. Living around all of the nobility in Albion, she was just an island girl trying to do better for herself. That was very admirable. She was determined to go to school and prove to everyone that she can be just as smart as anyone else, and she wasn’t going to let anyone stand in her while she proved that point. I loved that she was so different from everyone else, and she didn’t let the fact that she was different bring her down. I think I’m a little bit in love with Finn, as he was oh-so-swoon-worthy. I was intrigued by him throughout the novel, even when he was being super mysterious and keeping secrets. I wanted to know what those secrets were. I love that he treated Jessamin so differently than everyone else. He really cared for her. They were a great couple together. The storyline and world-building for the book was really creative; I can’t say that I’ve read anything like it before. I was really surprised that this book wasn’t the first in a series, but a standalone novel instead. White could have totally expanded this story into many more books. But I also like that it was a standalone, and I enjoyed the feeling of closure at the end of the book. There is a bit of a twist at the end of the book that I should have seen coming, but totally didn’t. I loved the last few pages of the book. I closed the last page with a huge smile on my face. 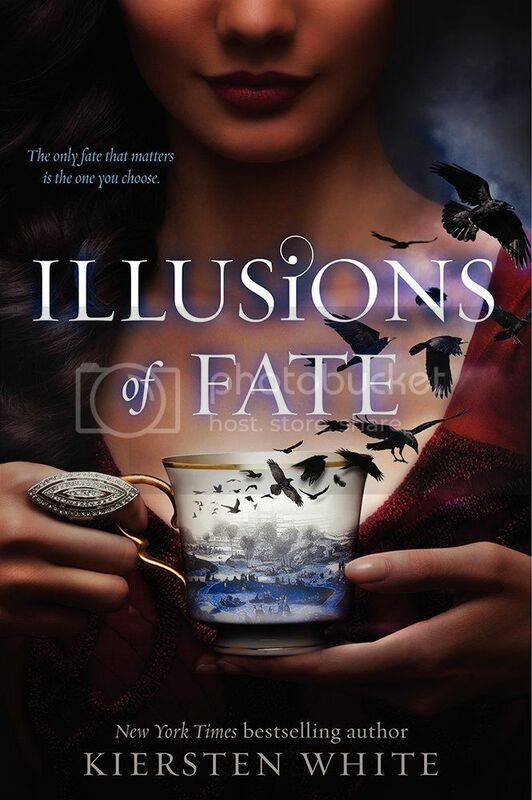 Overall; I thought that Illusions of Fate was a really interesting read. I went into it not really knowing what to expect, but I found the story to be unique and entertaining. I can’t wait to see what White comes up with next! Sounds promising! This is on my TBR list! I loved Kiersten's Paranormalcy series! Sounds like this doesn't disappoint! I left a comment here yesterday but I don't think it posted? I loved Kiersten's Paranormalcy series! Illusions of Fate sounds marvelous! I put it on my wish-list!